IMC - BIRTHDAY 15th – THE EMOTIONAL REMAINS! On November 10, 2018, at Song Hong Resort, IMC System organized ” Birthday Event of the System” with the participation of more than 400 employees and 100 guests. The event stayed many impressions and emotions in the attendees. Exciting, uplifting and colorful are the best adjectives that describe the team-buiding program. We had a great experience with extremely fun photos in the morning. For the team building program, the teams had “strategic” discussion to allocate human resources and find the clear tactics . The custumes with characteristic color and the cheering dances of every team are also “elaborately invested and trained”. Five Teams: “Chuoi man”, “Thien Co”, “” Red cannon “,” Hung Vuong “… came out with the best atmosphere and spirit. Due to the team games and exciting cheers, everyone felt tired but very happy and especially the co-workers relationship were getting closer and closer. The enjoyable experiences in team-building activities also helped the members gain more energy to work and fight for the overall target of the System. The celebration program brought the depressive emotions, and sacred feelings to all audience through the movies, gratitude and meaningful awards. The Birthday event of the system was an opportunity for the leaders of the company to express their gratitude to the staff who have been attaching to IMC, especially the members who have been attaching and dedicating for 10 years. 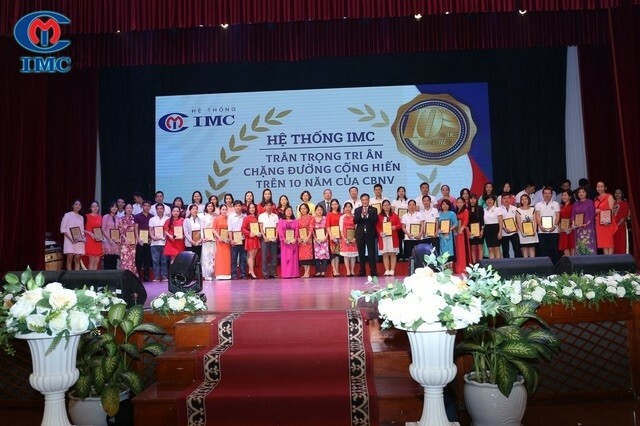 The emotional and enthusiastic artworks of the contest “the IMC system in my heart” were also composed with the pleasant feeling of all employees, groups/ departments/ factories. Every IMC member could feel that this is not only the company or co-worker relationship but also the family relationship and brotherhood. It was a sentiment, a sacred value that every member can deeply feel in this special occasion. The shake hands, the long hugs and the stories together will surely be the most wonderful moment, a treasured memory for today, tomorrow and the following days. Closing the event, everyone will have their own personal impressions and feelings. But it is certain that we will always be a family – The IMC family will always unite, stand side by side to conquer new successes in future.